Mr. Żukiewicz has performed across Europe, the United States and Canada. His performance during the 2007 Millennium Stage Conservatory Project at the Kennedy Center in Washington, DC was broadcast online. He has also appeared many times on TV in Poland. In Canada, Mr. Żukiewicz has recently won the TD Canada Trust Music Competition, which took place in Elora, ON. He was also awarded the 2nd Prize at the 13th Pacific Piano Competition in Richmond, BC. Mr. Żukiewicz holds a Masters of Music degree from Indiana University and is currently enrolled in the Doctorate of Musical Arts program at the University of Toronto Faculty of Music, studying with Marietta Orlov. His previous teachers include: James Parker, Arnaldo Cohen, Ian Fountain, Vanessa Latarche, Dario de Rosa, Alberto Miodini and Paweł Zawadzki. 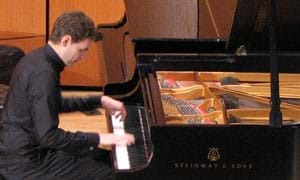 Winner of 2012 Shean Piano Competition: Adam Żukiewicz! The winner of the Shean Piano Competition 2010 is Scott MacIsaac!